This basil paste helps make a great base to a pesto it adds a great flavour and it beeats dried hands down and it is your best choice after fresh and is handy keeps in your fridge and freezers and is cheaper than buying fresh but your better off growing your own. Gourment Garden paste basil is so handy to have at home for my cooking with pasta,vegetables and meat.It tastes great and there is no mess,too easy! I love these herbs they are so much nicer than dried herbs and have a much more realistic flavour, they are the next best thing to fresh. I love these Gormet Gatden pastes and the basil one doesn’t disdains. It’s so convenient, lasts a long time and perfect addition to pasta sauces and stirfrys. The beauty of it is that it’s available all year around. Gourmet Garden Paste Basil is a great alternative to fresh basil. The flavour is lovely, it’s super-convenient, and no wastage. I would recommend this product to others. 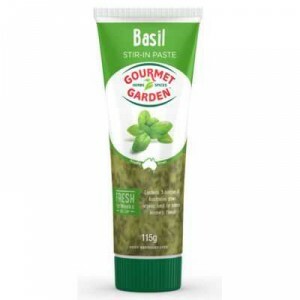 How would you rate Gourmet Garden Paste Basil?